Toward the end of the 1700s, the evangelical movement in Britain argued that one’s commitment to Christ should be reflected in action, primarily the effort to end slavery in the British empire and to proselytize or seek converts among the “heathen.” Initially, the English East India Company had prohibited Christian missionaries from living within their territories and seeking Indian converts in order to prevent any unrest or opposition to the Company’s trade and political control. In 1813, when the British Parliament was considering the renewal of the charter that authorized the Company’s trade and political control in India, members of Parliament who were committed evangelical Christians, mainly Baptists and Methodists, forced the Company to permit missionaries to settle in their territory. Once in India, Protestant missionaries criticized Hindu religious practices such as the use of images in worship and social customs such as early marriage and sati as superstitious and barbaric. James Peggs (1793-1850) had been a missionary at Cuttack, Orissa, south of Calcutta, and published this edition of his book in 1832 when Parliament was again reviewing the charter of the Company. Then residing in England, he sought to influence Parliament to give firm instructions to the Company to exert greater control over Hindu social customs and religious practices that he considered evil. Peggs claimed that self-immolation continued among Hindu widows, and that the Company must take more vigorous measures to enforce the prohibition on sati. 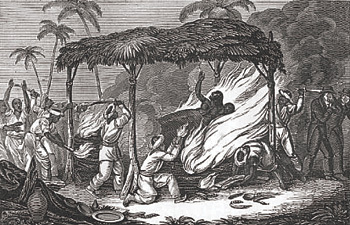 This illustration “Burning a Hindoo Widow” appears opposite page 213, the first page of Peggs’s compendium of sources and commentary on “Suttees.” It is one of the most frequently reproduced 19th-century images of the ritual of sati. It was intended to influence Britons to support strong enforcement of the prohibition on sati. Compare this image to that in Drake’s travel collection of 1768 and note the details of this engraving that would serve Peggs’s goal. Source: “Burning a Hindoo Widow”. In Peggs, James. India’s Cries to British Humanity, Relative to Infanticide, British Connection with Idolatry, Ghau Murders, Suttee, Slavery, and Colonization in India. Third edition, revised and enlarged. London: Simpkin and Marshall, Stationers' Court, 1832.